For lever or pedal harp. 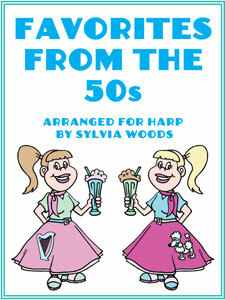 This book includes 40 favorite songs from the 1950s. These vintage songs were made popular by artists such as Paul Anka, Frankie Avalon, Harry Belafonte, Perry Como, Sam Cooke, Bobby Darin, Gene Kelly, Johnny Mathis, Patti Page, Elvis Presley, Frank Sinatra, the Champs, the Everly Brothers, The Fleetwoods, Buddy Holly and the Crickets, the Four Preps, and MORE! Plus, there are songs from The Sound of Music, The King and I, West Side Story, The Music Man, and The Howdy Doody Show. All of the pieces include fingerings, lyrics, and chord symbols. Lever changes and pedal changes are listed in the music. The difficulty varies, but most of the pieces are for advanced beginner to intermediate players. Many of the pieces require numerous lever changes within the music. To assist players who are not used to flipping levers, Sylvia has included a list of 15 pieces with no lever changes, and 7 pieces with just a few changes. To assist players of smaller harps, Sylvia has also included a chart showing the range needed for each piece. If you have a 26-string harp with C as the lowest string, you can play 30 of the 40 pieces with just a few easy modifications. You may have to play them an octave higher than written, but they will fit on your harp. Seven of the pieces have 2 separate arrangements: one for lever harp players who tune their harps to C, and another for lever harp players who tune their harps to 3 flats. Pedal harpists can play either version. The keys for harps tuned to C range from C to 2 sharps. The keys for harps tuned to flats range from 1 flat to 2 sharps. In order to play all of the songs, you will need a full set of levers. This book is 122 pages, spiral-bound, including 112 pages of music. Want it now? This music is also available as a PDF download. Click on the to see a sample of the first few lines of music.